So, too, as it now turns out, was Mubarak’s determination to stay in power after 30 years in office by rigging a series of presidential and parliamentary elections. In December, his ruling party won a landslide of Saddam Hussein proportions. Yet Hillary Clinton, US Secretary of State, issued nothing more trenchant than some mildly deprecating remarks and President Obama gave the diplomatic equivalent of a wry shrug even as the man who for decades had been a lynchpin of US policy in the Middle East cut an increasingly absurd figure. In Washington, they are now playing a panicked game of catch-up as mobs on the street said what America failed to see – that it was time for Mubarak and his chums across the region to go. There are similarities between Tunisia and Egypt; but even by Middle Eastern standards the spectacle of an 82-year-old president pressing for yet another term while entering his fourth decade in office was extreme. There was little doubt that Mubarak will now go. The appointment of his security chief as vice president (the post he held himself before taking power) implied that he had given up the idea of installing his son Gamal as successor. Tens of thousands of Egyptian demonstrators took to the streets on 25 January, young and old, Muslim and Christian, rich and poor, educated and not so-educated. They all chanted “Long live Egypt”, “Life, liberty and human dignity” and “Down with the Mubarak regime”. The scale of the protests came as a blow to all those who have been betting that a sleeping dragon will continue its slumber. For three decades now, Egyptians have been kept on a tight leash, fed more with promises than with bread. They were cajoled into compliance by a media that has the interests of the regime at heart and a religious establishment that owes its allegiance and existence to the state, but were often threatened into submission by the force of the baton if they refused to comply. Egyptian grievances are numerous. They have seen neither the fruits of peace nor of the huge economic growth that Egypt is reported to be making in international economic indices. What they experience on a daily basis is endless queuing for inedible bread and suffocating traffic congestion as the police force is increasingly burdened with the task of protecting the regime and its men. There were also demonstrations last month calling for a minimum monthly wage of 1,200 Egyptian pounds (roughly £130). Too much, said the government. It could only promise to institute a minimum wage of 400LE (£43). This is hardly surprising from a government made up of businesspeople who no doubt have a vested interest in keeping wages as low as possible. Grievances of Egyptian protesters have focused on legal and political issues including police brutality, state of emergency laws, lack of free elections and freedom of speech, and uncontrollable corruption, as well as economic issues including high unemployment, food price inflation, and low minimum wages. The primary demands from protest organizers was the end of the Hosni Mubarak regime, the end of Emergency Law, freedom, justice, a responsive non-military government, and management of Egypt’s resources. Labour unions were said to play an integral part in the protests. As of 16 February, at least 365 deaths had been reported, and those injured number in the thousands. The capital city of Cairo was described as “a war zone,” and the port city of Suez has been the scene of frequent violent clashes. The government imposed a curfew that protesters defied and that the police and military did not enforce. The presence of Egypt’s Central Security Forces police, loyal to Mubarak, was gradually replaced by largely restrained military troops. In the absence of police, there was looting by gangs that opposition sources said were instigated by plainclothes police officers. In response, civilians self-organized watch groups to protect neighbourhoods. International response to the protests was initially mixed, though most have called for some sort of peaceful protests on both sides and moves toward reform. Mostly Western governments also expressed concern for the situation. Many governments issued travel advisories and began making attempts at evacuating their citizens from the country. 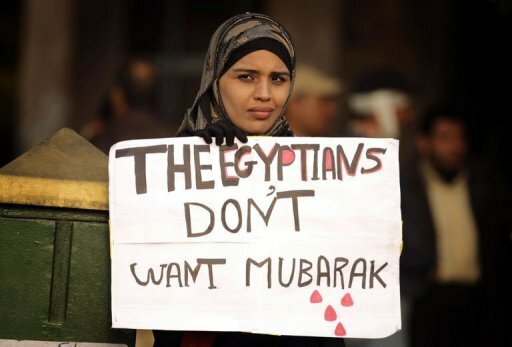 The Egyptian Revolution, along with Tunisian events, has influenced demonstrations in other Arab countries including Yemen, Bahrain, Jordan and Libya. Mubarak dissolved his government and appointed military figure and former head of the Egyptian General Intelligence Directorate Omar Suleiman as Vice-President in an attempt to quell dissent. Mubarak asked aviation minister and former chief of Egypt’s Air Force, Ahmed Shafik, to form a new government. Mohamed ElBaradei became a major figure of the opposition, with all major opposition groups supporting his role as a negotiator for some form of transitional unity government. In response to mounting pressure Mubarak announced he would not seek re-election in September. On 11 February, Vice President Omar Suleiman announced that Mubarak would be stepping down as president and turning power over to the Supreme Council of the Armed Forces. The junta, headed by effective head of state Mohamed Hussein Tantawi, announced on 13 February that the constitution would be suspended, both houses of parliament dissolved, and that the military would rule for six months until elections could be held. The prior cabinet, including Prime Minister Ahmed Shafik, would continue to serve as a caretaker government until a new one is formed. First Tunisia, Then Egypt, Now Yemen. What will happen ahead? Will this create a revolution in Europe too? ?